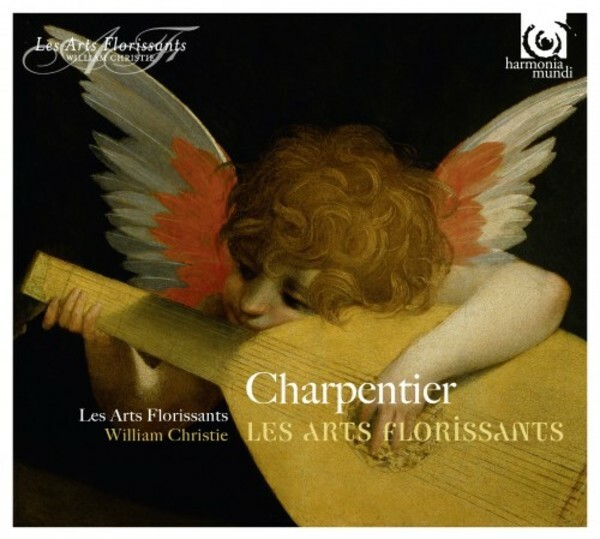 Les Arts florissants is the piece from which the eponymous ensemble took its name. This work belongs to the category of musical allegories, mostly from antique mythology, as a tribute to a royal person. In this case that person was the French king Louis XIV, although Charpentier didn't compose it for the royal court, but for the ensemble of Marie de Lorraine, the Duchess of Guise, in whose service he spent a considerable part of his life. Les Arts florissants is an allegory on the power of the arts: Music (La Musique) and Poetry (La Po�sie) praise Louis for bringing peace, whereas Painting (La Peinture) - a role which Charpentier himself sang at the first performance - considers himself hardly good enough to paint the greatness of the king. Conflict (La Discorde) and his furies try to bring disasters to the world, but Peace (La Paix) chases them off. The piece ends with a chorus of Arts and Soldiers wishing peace to last forever. The contrasts in this 'opera' are impressively realised by Charpentier: they not only regard those between the arts and La Discorde but also within the choruses of Soldiers which sing the praise of La Musique but which also refer to the terror of war: "How sweet is it to hear your heavenly sound, after the terrible noises of blazing war guns and his thundering echo."